Getting a jumpstart on the competition has a new, global approach today. As the Integrated Systems Europe show continues to impress with its growth, key product launches are following suit there, and there’s a great opportunity to take advantage of seeing the latest technology innovations on display a full four months ahead of North America’s big AV show. The ever-sizable crowds were one apparent indication, well supported by the post-show registration figures: over 22,000 first-time attendees made up the more than 73,000 registered show goers. For those that have been making the journey from the United States over the years, the familiar faces have greatly increased; “dramatically more” than past years, including global end users, as stated by Brian McClimans, Peerless-AV VP of sales, Americas and APAC. He also noted the dominance of LED on the technology side at ISE, a factor on big, bright display from the expansive digital signage hall at one end of the RAI, to the mapped projection greeting visitors at the main hall entrance, to Samsung’s residence in an entire hall to itself—and, of course, everywhere in between. From the broader technology perspective of major talking points heard across all 14 halls, open systems architectures, valued partners, scalability, data, AV/XaaS were all persistent refrains, along with intuitive solutions taking priority over isolated SKUs. Networking and the continued shift to delivering AV signals over IP continue to mature as topics with significant developments highlighted by practically every exhibitor. Of most note in this area were Audinate’s Dante Domain Manager, a server-based software solution for managing Dante networks and driving service opportunities; QSC’s demonstration of Q-SYS running on a standard Dell server; increasing adoption of the AES67—Symetrix announced its membership in the interoperability protocol’s Media Networking Alliance (MNA); along with additional Dante product introductions, including Biamp’s TesiraFORTÉ DAN most notably, but various others, like SoundTube’s IPD in-ceiling speakers and Harman’s Enova DGX audio switching board kits. Standouts on the video side of the network growth included launch of the Software Defined Video over Ethernet Alliance (SDVoE); Atlona’s IP-based Velocity Control platform; Black Box’s Boxzilla KVM and AV/IT system management platform; Crestron’s DM NVX Series, a software-defined matrix transmitting 4K60 4:4:4 HDR video over standard 1Gb Ethernet without latency; tvONE’s powerhouse Coriomaster processor is now capable of IP streaming; along with Adder’s emphasis on scalability with its IP-based KVM solutions, including the preview of the CCS-PRO8 switch to seamlessly move across screens among up to eight computers—the company reports up to 1,800 endpoints are connected in its largest deployment. As an early champion of the software-defined AV environment, Utelogy continues to fine tune its 2.0 platform for AV control, management, and analytics software, now with NOC functionality built in, white-labeling capabilities, and the release of its API and SDK for third-party integration to add services and recurring revenue programs. Collaboration technology persists to command attention with new players still entering the field. Avocor was one relative newcomer, having spun off from one of SMART’s distributors in the U.K. this past year and now launched in the U.S. under distribution from Almo. The Avocor interactive touchscreens serve as an agnostic endpoint for your collaboration software of choice; Prysm had the system on demo at its booth, as did Nureva. Intel was another notable newcomer to the collaboration displays with the Unite platform, featuring an array of new features added since its first announcement in June of 2016, including meeting room analytics, support for open devices, mobile capabilities, and static PIN. The Unite platform is differentiated by its open architecture and offers a lower price point than the Microsoft Surface Hub. Elsewhere on the standards-based collaborative display front, InFocus’ ConX scalable, enterprise-grade video meeting service is gaining traction, especially with banks and in finance and other enterprise SMBs, and when paired with a Mondopad, demonstrates the company’s strength in providing a full solution to meeting rooms. Many manufacturers are differentiating themselves with white-glove service solutions for the integration channel. Analog Way is one example, introducing the RCU300 control unit, targeting new markets for the company with the ability to control multiple Ascender seamless switchers, expanding its video processing capabilities to 24 layers. As a small engineering company, Analog Way is bolstered by a nimbleness to create complete platform solutions as a service to consultants. Training and education were major topics for many exhibitors as well, advocating a renewed sense of support for the AV integration channel. This was stated as the number one goal of the new SDVoE Alliance at a “meet the founders” event. For Bob Michaels, CEO of ZeeVee, joining the SDVoE, “it’s about leadership” in the industry, as the organization seeks to advance AV’s shift into software and service-centric business models. Michaels has observed that in conversations with integrators, there’s a hunger for more education, which amounts to a “don’t sell me; teach me,” dynamic. And, of course, what high tech exhibition would be complete without new applications that emerging technology presents? While there was plenty of whizbang to go around, Epson’s AR glasses demo stood out for an application both creative and practically addressing an interesting niche: multilingual opera houses, offering subtitles visible through the glasses. In their third generation, Epson’s Moverio AR smart glasses are also being deployed in the drone market and museum tours. Epson’s expansive booth highlighted a wide range of projectors enabling unique applications across verticals. The Pro L-Series added four new models, strengthening offerings in lower weight, enhanced 4K, and new resolutions (SXGA+, with 4:3 aspect ratio for better edge blending), and remote image capture with built-in camera for diagnostics. Harman also scored points with creative applications employing heatmaps, lighting, and analytics in a retail application, outlining related service opportunities along with it. Additionally, Harman has managed to beat Amazon’s Alexa to the boardroom with IBM’s Watson voice-enabled cognitive room control, built on AMX, scheduled to ship in May. 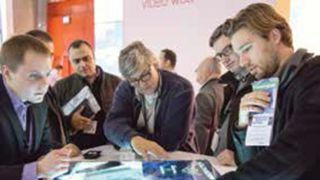 At the end of a five-day trade show, aside from feeling overwhelmed, most attendees of ISE 2017 likely departed Amsterdam with many new ideas, along with an energy and momentum to sustain right on up to InfoComm in June—at which point, we all get to experience the latest big ideas. Lindsey M. Adler is editor of SCN. Follow her on Twitter @lindseymadler. Additional reporting contributed by Margot Douaihy, Paddy Baker, and Duncan Proctor. How will the industry be different in five years’ time, and how will your offering be different as a consequence? AV-over-IP technology reigned supreme across ISE’s vast span of the Amsterdam RAI. As such, the importance of network security is increasingly evident, and it was addressed head on in a joint CEDIA/InfoComm conference held the final day of the show. The concluding panel discussion jumped right into a Q&A to address issues of most interest to the attendees. Some practical best practices were covered, including the pressing need to abandon the habit of port forwarding for remote access (use VPN instead) and providing unique passwords that aren’t shared. It just so happens that none of those best practices are difficult to implement, by any means. “It’s so easy now to put a VPN on Android, iPhone—really any of the access points (Macs and PCs)—there’s really no reason most people can’t have a persistent or nearly persistent VPN and be inside their house,” explained Stuart Rench, CEO, Ihiji. Fisher went on to explain how manufacturers are the ones that need to make security changes, influenced either by regulation or consumer demands. Here’s a brief summary of some other key product introductions at ISE. Head to AVNetwork.com/0417 for more info on all of these. * Crestron Mercury (pictured) is an all-in-one tabletop meeting room console, empowering presentation, mobile or SIP phone calls, any PC-based collaboration solution, built-in occupancy sensor for data collection, along with a PinPoint proximity beacon. * tvONE’s OneRack has added a dual redundant hot swappable power supply. Also the Coriomaster Micro, boasting a smaller form factor with the same power as its sibling the Coriomaster Mini. * Alcorn McBride’s RidePlayer synchronizes audio ride control between vehicles. * Barix upgraded its Audio Signage platform to deliver multiple audio tracks to single- or multiscreen digital signage installs. * Attero Tech unHX2D, where the “un” stands for “uncomplicated,” in this combined embedder/de-embedder, which is Dante enabled, designed to bridge two-channel PCM HDMI audio to or from a Dante network. * Matrox launched the Maevex 6150 4K quad encoder, streaming zero-latency pass through to all four inputs. * Peerless SmartMount Supreme Full-Service Video Wall Mount (DSVW775), designed for tool-less micro adjustments on the X, Y, and Z axes. * Atlona SW-510-W had its world premier, an addition to the five-input SW Series of signal switching and extension, the first with USB-C input alongside HDMI and DisplayPort. * Control4 added Bakpak network management software to Pakedge RK-1 routers, in an ongoing effort to make the monitoring solution ubiquitous, following the acquisition of Pakedge in 2016. * Screen Innovations Zero G motorized screen appears to levitate in mid-air and silently retracts when not in use. * Middle Atlantic Products’ Proximity Series Mounting Plate mounts small devices to the back of any display. * KanexPro Active Optical Cable, an HDMI 2.0 cable over fiber delivering 18Gbps bandwidth and 4K up to 60Hz. * RTI’s CX10 countertop/under-cabinet touchpanel features a fully customizable 10-inch LCD with direct control options and HD video. * AudioControl Director M4800 amplifier, combining 100 watts/8 ohms, 200 watts/4 ohms of output into an 8x4 stereo matrix, along with network monitoring and programming.